Food, Family, Fun. 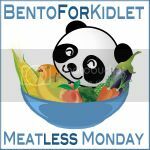 : Vegetarian, No sandwich lunches! Lately, I have been drooling over the lunches on Organized Bites. Everything looks so wonderful and I would love for my girls to eat like that! 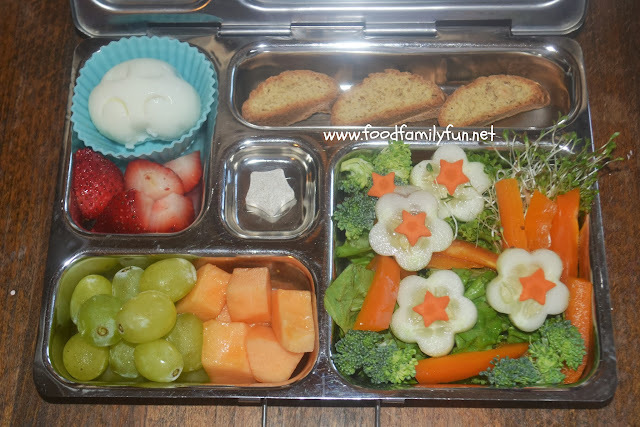 The lunches I packed today are sort of a nod to Scout's lunches as they were really the general idea that inspired me. Rose's lunch. I did not focus on a theme today, more the actual foods. 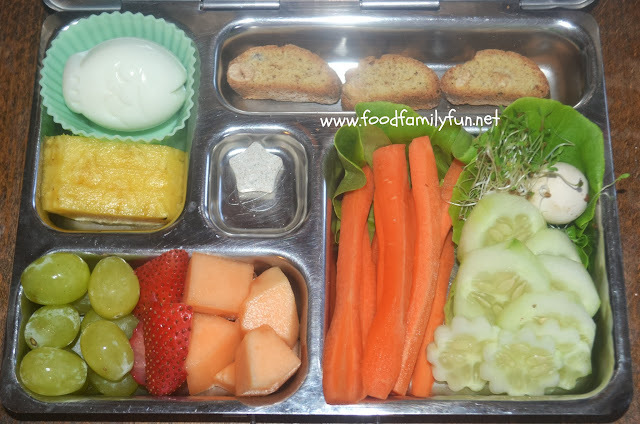 boiled egg, strawberries, grapes & cantaloupe, hazelnut biscotti, salad with baby curly leaf lettuce, broccoli, cucumber, carrots, orange pepper, and alfalfa sprouts and the little star is a vitamin. Rose ASKED for salad today. yay! She just said "no radishes, please". So she has 3 new items today - hazelnut biscotti, raw broccoli and alfalfa sprouts. She prefers cooked broccoli so I'm just giving raw broccoli a little lunch test. I cut the pieces very tiny so they can be a little nibble for each bite. Amy's Lunch - she's my most picky eater. boiled egg, pineapple, grapes, strawberries, cantaloupe, hazelnut biscotti, butter lettuce, carrots, cucumbers, a single baby button mushroom and a tiny bunch of alfalfa sprouts. The number of raw vegetables that Amy likes is very limited. Cooked is a different story and she eats lots at dinner, but cooked and then cold in a lunch she doesn't like either (most of the time). The mushrooms and alfalfa sprouts are new. Also, I am not sure that she will eat the lettuce but I sure hope that she tries it! It's a very nice baby butter lettuce from Wadson's farms. She also does not like any kind of salad dressing at all so there's no sending some dressing as a dip for encouragement. She doesn't like any of the store bought varieties and none of the homemade ones that I have made. I have been trying to give her salad type vegetables for ages in the hopes that I could build up to an actual salad. Still workin' on it! so sad, my camera dropped also. UGH I just sent it off to get fixed to the tune of $300 something dollars! Arrr! It's Talk Like a Pirate Day! Simple lunch for a picky girl!